TLANTA GOT ITS start in 1836, when a railroad engineer pounded a stake into the ground near the Chattahoochee River, and then turned to write the word “Terminus” in his notebook. It is nearly always hot in the spot he chose, and I am certain his sweat dropped to the ground as he wrote it. The city that would one day sprawl itself across the southern roots of the Appalachian mountains was originally an endpoint of a new railway being laid south from Chattanooga. General William Sherman would follow the line of that same railroad on his way to burn Atlanta out of existence 29 years later. Species sometimes have an end, both physically, like on a map, and temporally, which we call extinction. Sometimes extinctions come suddenly, but more often they are the result of attrition–the long, disappointing and inevitable outcome of a losing war fought against climate, mankind and time. Not far from Atlanta, in the mountains just east of that old rail line, there is another kind of terminus. On a north-facing slope, in a rivulet feeding a creek, which in turn feeds a river flowing north, swims the loneliest brook trout in the world. It is the Omega: the last, most Southerly, and most threatened native fish of its kind. It is part of the retreating rearguard in one species’ long battle. I set out to find it. ATLANTA IS hot, and so are the mountains around it; summertime temperatures can cross 100 degrees even at altitudes where brook trout still swim. And yet not so long ago these same peaks had an alpine climate; indeed for the last one hundred thousand years they’ve been cold far more often than they have been hot. We are in what geologists call an “interstitial” age: a gap in time between periods when the polar ice caps stretched (and will stretch) as far south as Pennsylvania. Roughly fourteen thousand years ago, the caps began thinning for our current respite, and the glaciers retreated. With the icebox shrinking, northern boreal species like elk, moose and brown bear also retreated. Brook trout–arctic char, biologically speaking–went with them. The brook trout that today reach impressive sizes in Labrador are the descendants of fish with a range stretching well south beyond Atlanta, probably into the heart of what was cotton country when Sherman marched to the sea. 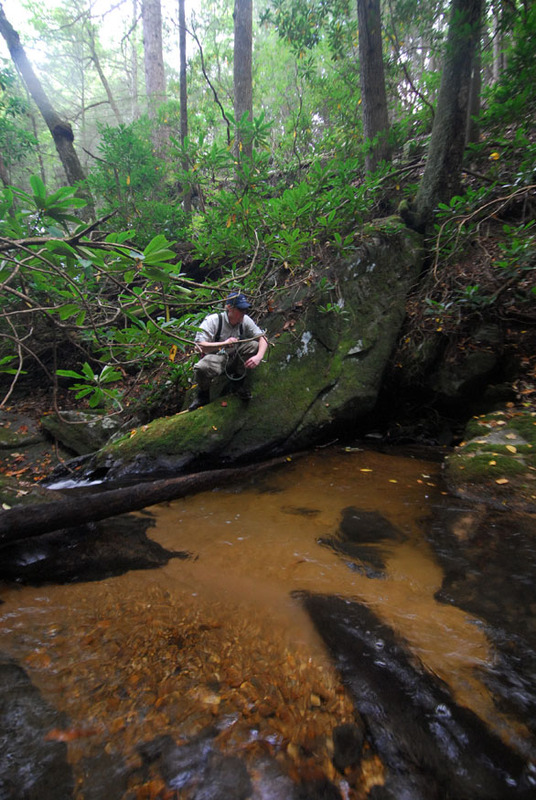 When man first colonized Georgia, not long after the ice melted and opened a door from Asia, brook trout here probably reached Labrador-like sizes. 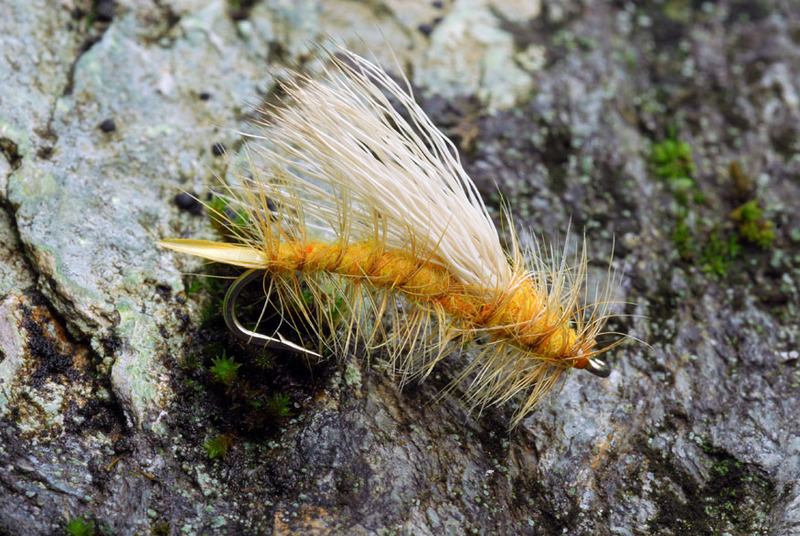 The Chattahoochee, today a striper and bass river, may well have sported a mouse hatch. No longer. 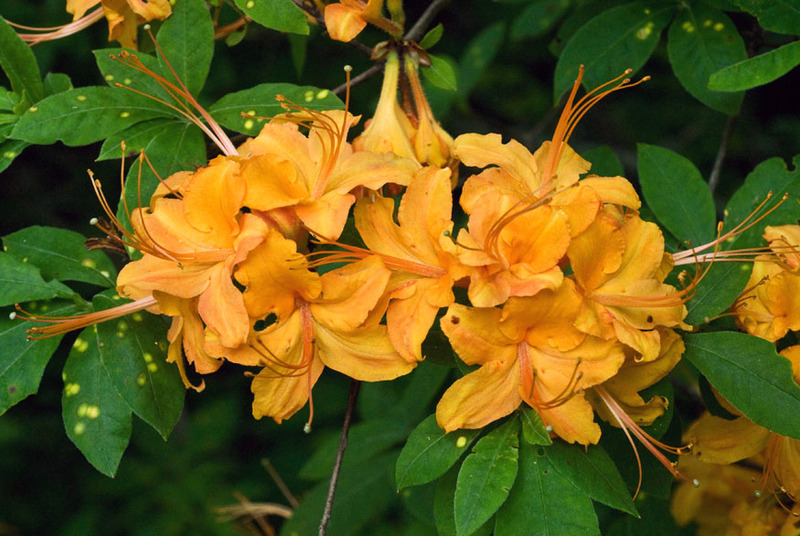 Flame azalea festoons the banks. Today’s southern Appalachian brook trout are like bonsai trees: stunted, yet beautiful. A seven-year-old, mature Georgia brookie might attain a length of ten inches; a whopper by local standards. Oral histories say that as late as the 19th century the brook trout was a substantial fish: fourteen-to-eighteen inches and suitable for fish fries for the loggers who came to cut down the old-growth. With the forests went the shade, and the bank stabilizing strength of the old trees’ roots. Consequently, lowland rivers grew warmer, from the sun and the silt loads they suddenly carried. The brook trout retreated, and well-meaning anglers restocked the rivers with rainbow trout imported from the Rockies. 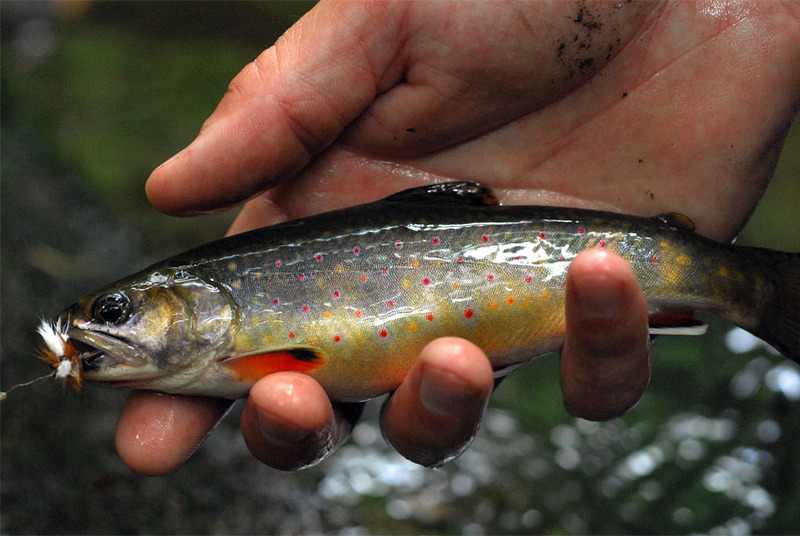 Rainbows outcompete brookies in their habitat, so that even today, with the forests returning, the brook trout are forced into higher and higher elevations. The first order of business in locating the southernmost population of native brook trout in the world is to get out a map. There is an organization called the Eastern Brook Trout Joint Venture, which has painstakingly mapped the remaining habitat of the brook trout. Its map is a wonder of technology: you can zoom in to the county level to identify regions by color code. And yet it is covered in dirty words, like graffiti: Dawson County, Georgia–extirpated; Rabun County, Georgia–reduced. I identified one ancient brook trout habitat beneath what is today an outlet mall. None of the counties are labeled “intact.” But, enigmatically, some are labeled, simply, unknown. Sometimes a place can be so so small, it even has a hard time hanging onto its name. I owe a friend, Andrew, for unlocking the next clue in the puzzle: He pointed me to a University of Georgia graduate student’s study, then already a few years old, listing several obscure creeks and the results of a small team’s efforts to hydroshock the water and determine the numbers of brook trout. Most of these numbers were depressing, naturally, but one creek stood out. It took me some time to identify it on a map. Sometimes a place can be so small, it even has a hard time hanging onto its name. Carved deep into a steep-walled canyon, it was more than a mile from the nearest logging road, and across what was obviously rugged country, even on the map. It is not far from the Appalachian Trail, but no trail leads there. Between periods of thunderstorms, my friend and I strapped on our packs and drove as close to the spot as we could get. Andrew had scouted the creek once before and knew where to leave our car; seemingly right on the edge of a precipice dropping several hundred feet into a river valley. We plunged over the edge, sliding as often as walking, rods waving behind us like insect antennae. These hills had been logged only sporadically, and I crushed ancient stumps beneath my boot heels, sinking deep in the loam and lichen with each step. At the bottom we reached the river; small here but still too exposed and warm for brook trout. Rainbows had invaded, and spiders built their webs across each narrow spot. As we waded upstream, the sun crested the top of the valley wall, dappling the stream with flickering light. A few hundred yards from our entry point we waded into the mouth of the creek we’d been seeking. Massive downed trees crisscrossed the water, at times making convenient bridges. One must be low, slow-moving, and stealthy. The water was cold there, and that is critical. Rhododendron–a northern species itself–shaded the creek and at times completely obscured it. We were forced to shimmy between its finger-like branches in order to cast. Every few yards we found a spillway, damming a small pool, not even big enough to bathe in. And in every pool, we found brook trout. Biologists will say that the Southern Appalachian Brook Trout can only be separated from its Northern Appalachian variety through complicated genetic tests or with a very knowing eye–one able to differentiate numbers and locations of gill rakers. Others will say that there is no difference, that the “Southern” designation is simply an attempt to carve out a new species so that it can be listed under the Endangered Species Act. But the truth was clear: These fish had been here forever. No one had logged these hills; the hundred-foot trees with their massive trunks were testament to that. Certainly no one had stocked brook trout here. The rainbows we caught in the valley were all that were stocked–back when fishermen last cared about this spot. But more importantly, I knew from the look of these fish; larger than any I’ve caught in the South, even in the Smoky Mountains where they are tended like prizefighters. Their bellies were orange, their flanks yellow, and their backs dark and wormed. A brook trout’s mouth is like ink: shadow spills over its jaws, protecting it from the white flash of the open mouth, that betrays so many other trout. But even here, a fish must make a living. It’s not so often that a protein package the size of my #12 Stimulator makes its way into these waters, and we were low, slow-moving, and careful to remain camouflaged. We landed many fish given the small amount of water. At one point, I laid prone on a mossy bank, so close I could see the moss’s tiny flowers, at the foot of an ancient elm. I was spotting for my friend, concealed in the rhododendrons below, as we both watched a trophy brook trout sitting in his pool, the best in the creek. Yellow Stimulators rule the mountains. There is a certain magic in fishing small streams. You lose the size-ism we are all accustomed to as anglers. Your expectations are recalibrated, fitted to appreciate the best the water has to offer, and this is a good thing. The trophy we watched might have been ten inches long. I could see his white-tipped pectoral fins flicking back and forth, making course corrections so he could hold his lie. He was the biggest fish of his kind I have seen; certainly years old, probably done spawning for his lifetime. “Cast twelve feet to the left of the downed tree, just up in the foamline,” I told Andrew. He easily made the cast. The Stimmy drifted softly to the surface; rippled it. Little Yellow Sallies sporadically hatch in these mountains, so we’d chosen yellow as our color. The white-tipped fins flicked and the trout began his glide to intercept the fly. But you don’t get to be a seven-year-old fish in water like this without being the smartest. He inspected the fly for most of the length of the pool, waiting and watching. It slid slowly downstream, closer and closer to a large overhanging rhododendron limb, continuing to wait, until the shadow of the leaves just nicked the fly, then he struck, launching himself up and out of the water. Wise fish; he had used the rhododendron for cover before he revealed himself fully, and the rhododendron interfered with my friend’s hook set. Stung, but unhooked, the trout flitted quickly under a large rock, having just survived what may have been his first and only encounter with an artificial fly. We left his pool undisturbed, with no choice but to move on. We came to a place we dubbed “the Slides.” Water cascaded down a steep granite wall, requiring us to climb using both hands. The current was swift and the water icy. Each rock was covered in thick moss and lichen, and I knew that no one had been in this creek bottom for a long time. We paused for lunch, then continued out on top of the rift. We eventually came back to flat land, on the opposite side of the river valley where we’d left our car. A few hundred yards beyond that, we crossed a four-wheeler track, where man had left his mark. Dark, orange, and wormed.I don’t know if that creek holds the southernmost brook trout in the world. A surveyor might be able to tell you. I’ve been to other candidate creeks, weak anemic things exposed to logging roads and drying up in summer. I know this: if they still hold brookies, none of those other trickles can hang on for more than a few more seasons. Recurrent drought and higher summertime temperatures are the new reality here. And yet, in one icy, free-flowing creek, in a cleft of rock, the brook trout will survive a bit longer. Perhaps they will hang on long enough for the interstitial age to end and the climate to begin to cool once more. If that is the case, my isolated creek, and a handful others like it, may be the rootstock of the brook trout’s return to these lands. But for the time being, they are alone, on an island in the mountains, only a couple of hours from Atlanta. This article originally ran in the Fall 2012 issue of The Drake. 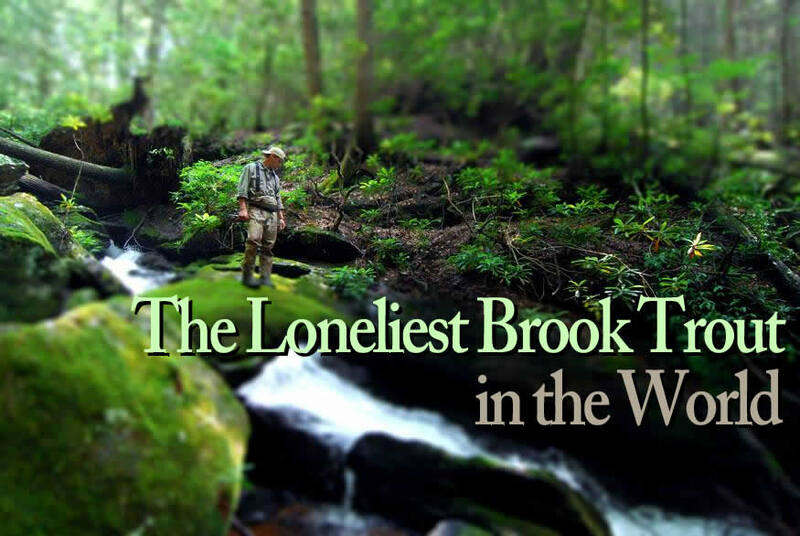 10 Responses to "The Loneliest Brook Trout in the World"
Seriously fascinating article, Zach. I have done a lot of research into the introduction of brown trout to New Zealand, so I find the trout-history, if you like, incredibly interesting! Look up their introduction into Kerguelen Island, and their presence as natives in the Atlas Mountains of Morocco, across the Strait of Gibraltar. Browns are fascinating too. Fantastic article, Zach! As an avid fly fishing “addict”, guide, and president of TU Chapter 201, The Southern Brookie holds a true special place in my heart. Our chapter has been doing extensive work on the Brook Trout Joint Venture, including small group fishing trips to locate existing populations, applying for various grants to help protect the populations we have found, and planning and trying to fund restoration projects for the streams as well. With an estimated intact population covering only 3% of the original habitats, Southern Brooks are one fish that truly need every bit of help we can give. Sadly, in the years I have spent fishing, as well as the time I have spent with TU, most of the research done points more to human influence being the biggest factor in the pop. decline. On the plus side though, Human impact is easier to reverse and repair than trying to change Nature. That is what we are using as a motivational fuel for our projects. TU Unaka Chapter #201 is HQ’d in Murphy, NC in Cherokee County, the southwestern-most point in NC, bordered by GA and TN. We cover a territory that encompasses the 4 SW counties of NC, Cherokee, Clay, Graham, and most of Macon counties. Again I say, GREAT article! I look forward to more of your intriguing writings in the future. Well done. The brook trout has done its part and has done it well. It’s now that man must stand up and do his part. Lets hope it’s not to late. Here in the Adirondacks, the DEC is doing good work restoring native strain brook trout to the backcountry ponds. Holdover rates are solid. The state record fish has been caught in two of these ponds the past couple years. Great read, Zach! I would be interested in reading that UGA study if you could point me in the right direction. I’ve spent an hour on Google and don’t think I turned up the right one yet. I always enjoy reading this article at least once every year Without question, one of my all time favorites. Each time I read it, I reflect on some new places I have been lucky enough to visit and catch an occasional wild brookie. It makes this article as fresh as the day it was published. Thanks George; I really appreciate that comment. What a wonderful story. I hope that little stream remains unknown and protected and that it’s brook trout thrive. I also hope that you update this story every decade or so.